A few days ago, I saw someone post a question saying "Why do People Hate Lebron James?" On the NBA 2K11 Forums, and I am here to give my honest opinion about Lebron's connection to sports today. Obviously, people from all around Cleveland hate Lebron James because of his in-your-face "decision" on live television that portrayed him telling everyone that he was leaving Cleveland to "bring his talents to South Beach," and "win multiple titles" when he didn't win anything in Cleveland and supposedly quit against the Boston Celtics, which all made Dan Gilbert, the owner of The Cleveland Cavaliers, show his feelings in a letter to Cleveland Cavaliers fans saying that they'll win a title before the "self-proclaimed king" does -- which is still up in the air for them (The Cleveland Cavaliers) to do so. 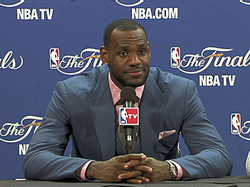 That all gathers up to why you may hate Lebron James. But, if you want to go more in-depth, I will go there myself to show my stance on this riveting subject: Lebron James -- my feelings after his decision -- is a self-imposed, narcissist who has no respect for the Cleveland fan base, and basically, shoved it down their faces that he's going to succeed and win multiple titles with The Miami Heat. Lebron James is someone who has twisted the feeling of sports; he is a player I do not respect nor do I think of him as a role model. Someone who wins championships in sports isn't a role model if he doesn't have respect to the fans, and the game itself.